Poll: Do you think Greece has been 'let off the hook'? 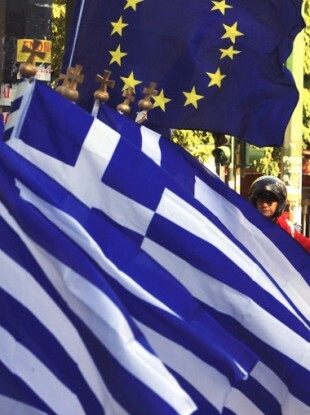 Greece has had 50 per cent of its debt burden written off in crisis Europe deal brokered early this morning. What are your feelings on this? Tell us here. THE NEWS THAT a deal had been brokered on the eurozone debt crisis came through early this morning. The headline detail was that Greece will have its debt written down by 50 per cent, with the private sector creditors taking a ‘voluntary’ 50 per cent cut on their investments, which will achieve a reduction of €100bn. In return, banks will receive around €30bn in credit enhancements. The Irish government has said that they welcomed the deal and that the reduction of Greece’s debt (Ireland will see no such reduction) will greatly reduce the risk of contagion in Europe and help recapitalise Europe’s banks. Pascal Donohue of Fine Gael has released a statement saying that Greece’s debts were unsustainable and that Greece’s people are “suffering greatly and paying dearly for this deal”, citing a VAT rate hike from 13 to 23 per cent, a cut on pension payments, a suspension of civil servants on partial pay and so on. Fianna Fail’s Finance spokesperson Michael McGrath said that it was “disappointing” that Ireland did not achieve a reduction in their debt burden. An article on Bloomberg this morning quotes a bond analyst as saying that the deal poses a political problem for the Government, and that the Greeks “who are seen to be behaving badly, get rewarded” while Ireland gets nothing. What is your take on the deal. Do you feel that Greece has somehow been ‘let off the hook’? Email “Poll: Do you think Greece has been 'let off the hook'?”. Feedback on “Poll: Do you think Greece has been 'let off the hook'?”.